Long retired, but still SO sweet! I love making baby and wedding cards - there is just something dear to me about sharing a celebration so absolutely precious with a handmade token of love. This stamp set has been retired for several years, but I still pull it out all the time because I love the whimsy of the images. If you wanted to recreate this card with a current SU! stamp, you could use Bitty Birthday (pg. 43*), Greetings Galore (pg. 52), Fun & Fast Notes (pg. 54), Year after Year (pg. 60), or Just Celebrate (pg. 8 in the Occasions Mini Collection 2008 Catalog). To skip the candles in the cake images, you could mask it or just ink the stamp with a Stampin' Write Journaler so that you could still do the water coloring without the ink smudging. A friend of mine just got married, and even though it's still a big secret (Shhh!) I had to make her a little card. 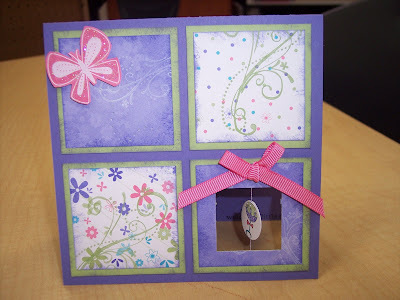 The inside corner is also stamped with the "It's time to celebrate!" 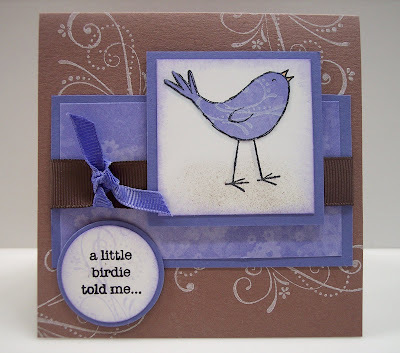 sentiment stamp from the same A Little Birdie Told Me stamp set. I haven't used this set much and I really hope it's not going to be on the Retiring List next month because I like it quite a bit and it has oodles of potential - I've just been too busy to create! I can hardly wait for summer break when I can hit the ink every day! !